This is a large inflatable sports bounce house combo. 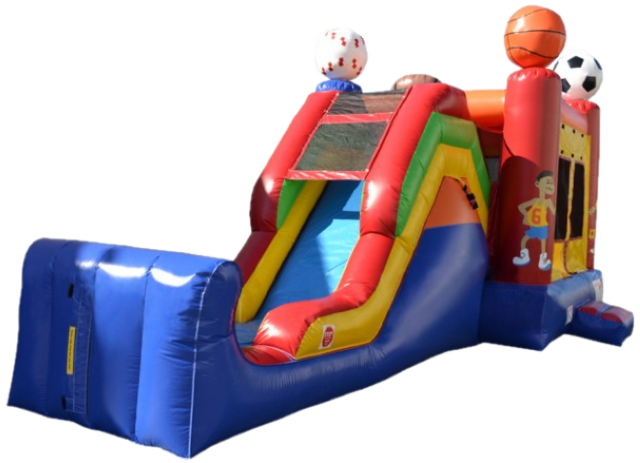 Some people refer to them as a 5 in 1 because it is a slide and bounce house together and it also has a basketball goal, climbing wall, and pop-ups inside. We offer free delivery to North Mobile county (Saraland, Satsuma, Creola, Chickasaw, Eight Mile, Turnerville, and select areas of Mobile). Call, text, or email if you fall outside of these cities to see about delivery.